Are you thinking about planning an ideal road trip on a budget? A road trip to one of the exotic locales in Europe or a stunning beach in the Caribbean will certainly get your spirits high and the anticipation soaring. However, the question is, are you prepared for the journey ahead? Is the budget preparation making you weary? Did you ever plan a road trip on a meager budget? Fret not! We have got you covered with our expert tips. These are sure to make the task easier for you. When it comes to road trip on a budget, it is all about saving money on food, gas, lodging, pit stops and so on. I would suggest you save extra bucks by packing your own meals. It is tempting to stop over at a cafe on your journey to grab a quick snack or a bag of crisps to munch on while driving but remember, all that adds up to the costs, especially if you’re on a long road trip. Spare some time to visit a store and buy yourself some snacks. Stock up on chocolate bars, granola bars, nuts and other light snacks like water and beverages. In addition, look for groceries. It will allow you to cook light meals like spaghetti, tomato soup and fix up salads to nosh on while traveling. Not only are these healthy they also add up to quite a lot of money savings. Use a good travel App like Tripadvisor and use the built-in map features to carve out a nice budget friendly route for your road trip. It is wise to plan beforehand and be familiar with the navigation before you hit the road. It will save you from being lost or stranded in the middle of nowhere. Furthermore, taking a wrong route or hitting an unclear direction is only going to waste fuel and time that will add to the expenses. 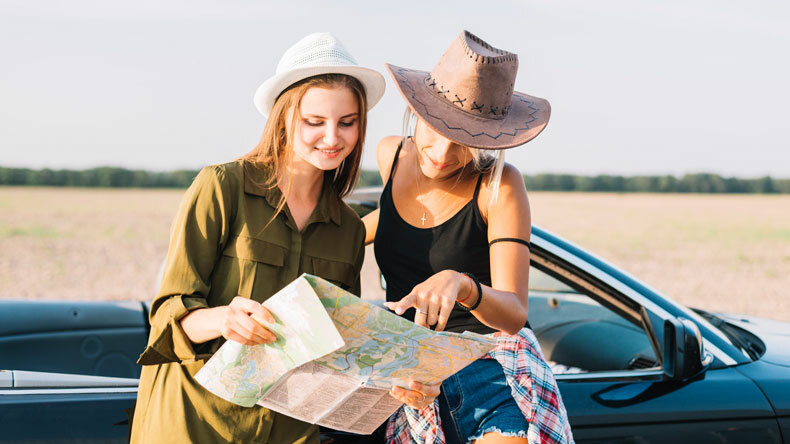 For a well-planned road trip on a budget, research for different routes and find the most feasible one that could save you time and money. A good idea is to make use of two different GPS systems; it will let you compare differences in routing from the two navigational tools.Use the iExit app to find major pit stops on highways along your journey. This is essentially my recommended tip for any road trip on a budget. Focus on recreational activities on your journey rather than opting to drive most of the time. Take up hiking or walking for a few miles instead of stepping on the pedal. For example, when crossing theme parks or national heritage sites, concentrate on covering two instead of five or six. Cover more miles by hiking instead of using the car. It will give you ample time to look around the breathtaking landscape while saving you fuel expenses and unnecessary stress. This is an excellent tip to follow for a road trip on a budget. Use a car camp to make up for cheap accommodation on long journeys, especially during the night travels. Depending on the people coming along and the size of your vehicle, pack a few pillows and sheets to set up a car camp for comfortable sleeping on your trip. If you prefer camping, buy yourself a nice inexpensive Coleman car camping tent on Amazon for only $40 or an REI Backpacker Bundle and a handy camp stove. This will surely make your trip even more exciting and budget friendly. Alternatively, you could choose to hire the services of a campervan, a live-in truck that is affordable and convenient. This will cost you way less than renting a hotel room every night. I would recommend you check out free attractions on your trip instead of buying expensive tickets to museums and art galleries. Even at popular destinations like Paris, Italy, and the UK, there are free tourist spots that include stunning locales, mesmerizing artwork, and inexpensive food offering a promising visitor experience. For a road trip on a budget, this must be your top consideration. Check out a National Park, enjoy a picnic on the sandy beaches, have fun engaging in a day-long hike, or spend some leisure time watching nightlife at a city center. Most holiday destinations offer visitor passes on low rates that include free entry to museums and historic sites as well as unlimited hours of public transport. I would recommend purchasing one of these visitor passes or a National Park Annual America. It allows you to visit three or more national parks within a year. The Pass for National Park includes an entrance fee for your vehicle along with all of its passengers. Check out for passes available within your trip route and plan beforehand for a wonderful road trip on a budget. If you are looking for a budget-friendly road trip, then plan your trip in offseason. Most hotels and diners offer discounted prices during this time, which you can benefit from. For example, the shoulder season is ideal for a road trip because you get less crowded areas, awesome weather, malls offering special discounts, and inexpensive accommodation.